Monica Nelson is a partner in the Providence office of Lewis Brisbois and a member of the Toxic Tort & Environmental Litigation Practice.​ Monica represents clients from diversified industries in complex products liability and toxic tort actions. Monica has extensive litigation experience and has effectively used her research, writing, and oral advocacy skills to resolve numerous matters by way of dynamic and spirited motion practice. 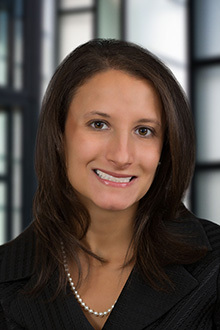 As part of her practice, Monica represents clients in depositions, motion hearings, arbitrations, mediations, and other proceedings in the state and federal courts of Rhode Island, Massachusetts, and Connecticut. Monica joined Lewis Brisbois from a Boston law firm specializing in toxic tort and asbestos litigation. Monica previously served as a legal research clerk to Connecticut Superior Court judges. In this position, she assisted in the researching and drafting of judicial decisions on diverse topics in civil litigation arising from premises and products liability claims, employment and civil rights actions, medical and professional malpractice suits, insurance coverage disputes, and complex commercial transactions. During law school, Monica also served as a judicial extern to a federal judge in the United States District Court for the District of Rhode Island. Monica has also worked for Yale Law School’s Jerome N. Frank Legal Services Organization, where she provided pro bono immigration legal services. 2006 Survey of Rhode Island Law, Property Law: East Bay Community Development Corporation v. Zoning Board of Review of the Town of Barrington, 901 A.2d 1136 (R.I. 2006),12 ROGERWILLIAMS U. L. REV. 625 (2007). Monica has been named a "Rising Star" by New England Super Lawyers in 2013, 2014, 2017, and 2018. "Rising Stars" are attorneys who are under 40, or who have been practicing for less than 10 years, and are selected from a rigorous peer review process.